Length with extension leaf is 180 cm. Width: 80 cm. Height: 72.5 cm. This IKEA Ingo solid pine two-seater table has a varnished finish. It has been used but is in good condition. Dimensions: W 75 x D 74 x H 73 cm. Solid Pine Table from ikea 75cm wide x 120cm long x 73cm high. Condition is Used. Some marks as was in kids room but will sand off easily. Legs detachable for easy transport. Good solid table. Round Ikea Dining table. 105 cms wide, 75 cms high. Has been used for a few years, but in good condition. Has a mark that can be seen in the photo. From a non-smoking house. Collection in person only. IKEA Arkelstorp Coffee Table 65x140x52cm Pine Home Living Room Lounge. Condition is Used. Pictures taken from current catalogue. Collection from Ilford Essex. Cash on collection preferred. I’m having a clear out - please see my other items. IKEA large pine kitchen dining table to seat 8-10 extending. Condition is Used. As you would expect, easily flat-packed for transportation. This is a large dining table of solid pine 180 x 105cm top 40mm thick. Stands 75 cm high. We are just five minutes from the M5 at Junction 25. Ikea Coffee Table Solid Pine With 6 Storage Compartment. Condition is Used. Generally good condition. Some small dents and marks to the top surface. Solid Pine Extendable Dining Table - Antique Look - Ikea Stornäs £225 - VGC!! Solid Pine Extendable Dining Table - Antique Look - Ikea Stornäs £225 - VGC!! Item in excellent used condition. A few scratches on the legs and a tiny dent on the table top as shown in the pictures. From a pet-free, smoke-free home. Having to sell because we are moving. Collection in person only from London East Finchley (N2 0). Coffee Table: pine base and top. Base chalk painted duck egg blue with distressing. Bees waxed. stone effect painted top with bees wax lacquered finish. Condition is Seller refurbished. 6 magazine racks provide plenty of storage space. Collection in person, though could consider delivery if buyer happy to cover van hire and fuel costs. Ikea 3-part pine wooden table with square ends sits from 4 to 6 people. Condition is Used. Length 116cm. Width 72cm. 1 small mark. Large Pine Farmhouse Oval Dining Table - seats up to 6 people. Lovely chunky farmhouse style dining table good condition however, there is a burn Mark on the surface which could be sanded down as shown in one of the photos. 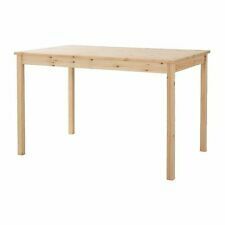 Ikea jokkmokk pine dining table. Solid pine, Stain, Clear acrylic lacquer. Length: 74cm. Good to know. Nike Karlsson. A pine demi lune shaped table with clever gate leg drop leaf side. This is a great space saving table suitable for 4 people when extended. The table is designed to sit against the wall and can easily be extended when required. This table is a high quality pine board dinning table By Ikea 180cm X 100cm. Condition is Used. There are knocks and bumps associated with family use over the last 5 years, but these just add to the appeal of this beautiful table. No postage, collection only, I may be able to deliver for fuel cost. Call 07887497231 for more details. ikea NORNAS Coffee Table Pine 89x59 cm, "Brand New"
Solid pine. Coffee table NORNÄS. Width:89 cm. Depth:59 cm. Height:45 cm. Length:91 cm. Width:77 cm. Height:5 cm. Pine wood stained. DARK BROWN. LOCAL PICKUP ONLY. Only 1x dining table is for sale. Good condition. Table top marked as per normal usage. Covers for dining chair cushions recently replaced. That’s why I used solid wood, which ages beautifully, is durable and feels honest – and put a lot of care into the details. My idea was for ARKELSTORP to be a modern interpretation of furniture that has roots in Swedish folklore. IKEA of Sweden. Solid pine, Acrylic paint. - Solid wood is a durable natural material. load: 50 kg. Renewable material (wood). This product requires assembly. Plastic bumpers for holding the table top in place are included. IKEA INGO solid pine wood coffee/ side tables x3 painted in wipeable light grey paint. Previously used as a low sideboard with storage underneath. They show some wear, the worst is a scratch to one of the tops as shown in photos. Measure approx: 58.5cm square and 49cm high. From a smoke free home. All are dismantled for collection. Collection is from SG14. Combines with other products in the INGO series. Solid pine; a natural material that ages beautifully. Solid pine. For increased stability, re-tighten the screws about two weeks after assembly. Wipe dry with a clean cloth. Ikea Pine Effect Table with strong metal legs which are easily unscrewed. Condition is Used - good with some light marks of natural wear and tear. Wood is a natural living material, and variations in the grain, colour and texture makes each piece of wood furniture unique. New FJÄLLBO Coffee table. Coffee table FJÄLLBO. Width: 46 cm. Height: 46 cm. Chair GAMLEBY. Key features. Solid pine, Stain, Clear acrylic lacquer. Wipe dry with a clean cloth. Wipe clean with a cloth dampened in a mild cleaner. Been used as a study table. Would make nice breakfast table. Can easily be dismantled and put back together (see photos). Good for a small space. Table LERHAMN. Solid pine, Stain, Clear acrylic lacquer. Length: 74 cm. Width: 74 cm. Height: 73 cm. Length: 76 cm. Length: 82 cm. Width: 38 cm. Ikea pine coffee table diy recovery 🤓. Condition is Used. Collection in person only. Fancy trying a bit of diy SOS. It was pine but I painted it mahogany, very stable as u would expect. Needs sanding and repainting,ideal hobby repair or hobby table. LERHAMN Table Black-brown Solid pine. The table’s simple design makes it easy to love and easy to place. The stained black-brown solid pine adds a warm, genuine feel to the room – a perfect match with LERHAMN chair. Leg: Solid pine, Solid birch. Runners: Solid birch. Solid pine; a natural material that ages beautifully. Basematerial: Solid pine. Drawer/ Rail: Steel, Epoxy/polyester powder coating. Cross rail: Steel, Epoxy powder coating. ARKELSTORP Coffee table. Coffee table ARKELSTORP. Drawer rail: Solid beech or birch. Length: 140 cm. Height: 52 cm. Width: 65 cm. Width: 52 cm. Table top/ Rail/ Leg/ Drawer front: Solid pine, Stain, Clear acrylic lacquer. Ikea Solid pine table. Condition is New. Collection in person only.